JMJ's "Souris Calle" is now available on Spotify et al. And... yeah. It's the mysterious "Chromatic" track from December 2017. 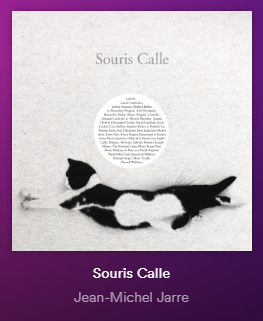 'Souris Calle' is also available on iTunes: https://iTunes.apple.com/gb/album/souris-calle/1438451264 . This track is sooooo much better than the new """"Equinoxe"""" Cr.. he's giving us so far! There's much more adventure in this! More please! Really? I think it's just a "filler" track. It's fun, with the purring cat and all, but not that big a deal. I don't have either Spotify or iTunes account (or as far as I know the second one was closed), YouTube link already somewhere for the new version? Amazon has a 30 second sample. Still bummed I can't buy a freaking mp3 file from that website because amazon.de doesn't "deliver" to the Netherlands. Oh my...that's one expensive cat!